My daughter loves crafting, drawing and anything having to do with stickers. SmitCo offers journals, scrapbooking sets and creative gifts that are great for summertime fun at home. Below are just a few products they offer. My daughter loves practicing to write her name, coloring and anything girly. SmitCo products come with all sorts coordinating accessories to promote creativity whether you're home or on-the-go. The mermaid set above even comes with a pouch to keep everything organized! If your little one loves a particular theme, SmitCo also offers specific sets like their Horse Scrapbook set. 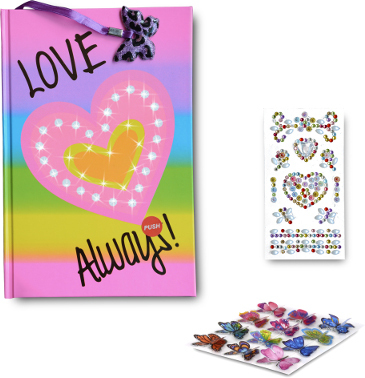 It has coordinating stickers so your child can create her own book with pictures, drawings and colorful accents. This set makes a great gift idea as a first scrapbook. SmitCo also offers smaller sets that are great for travel or on-the-go. I keep smaller activities handy in our diaper bag so my older daughter always has something to do if we're stuck waiting while we're out and about. I love the colorful designs of SmitCo journals, so cute! SmitCo also offers jewelry sets, accessories and coloring sets. They're offering my readers a 20% discount on their products with code N3CQD6AE. You can find their products on amazon below. What are some of your favorite ways to keep your kids entertained at home in the summer?